Choose your SSL certificate now from various range of certificates. We offers 100% satisfaction guarantee with all SSL certificates purchased via HostJinni.com. SSL Certificates or digital certificates are used to create a secure encrypted connection between your browser and server. It protects the sensitive data that is exchanged during your sessions. 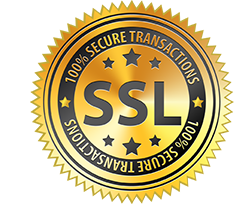 We offer a full line of SSL Certificate products to meet our customers demand. SSL Certificates serves as an electronic passport and helps to establish an online entity’s credentials when doing business on the web. We provide our customers with user-friendly SSL management interface. When you an SSL certificate to protect your website your visitors can rest assured that the data they enter can’t be viewed by cyber crooks. Our certificates use 2048-bit and SHA-2 encryption to protect your website from hackers. We provide the strongest encryption which is virtually untraceable. Small data files that digitally bind a cryptographic key to organization's details are called SSL certificates. It activates the padlock and the https protocol and allows secure connection from a web server to a browser when it is installed on a web server is generally used to secure credit card transaction, data transfer, and logins. This has become very important these days when it comes to secure browsing of social media sites. SSL certificates join a domain name, a server name or a hostname. It also blends an organizational identity and the location. Any organisation should have the SSl certificate installed in the web server. This is meant to initiate secure sessions with various browsers. A Secure Sockets Layer (SSL) certificate helps to authenticate the identity of a particular website and encrypts data sent to the server using SSL technology. SSL is used to secure data transfer, secure credit card transactions, safe browsing of social media sites and logins. SSL creates a secure tunnel through which sensitive information including passwords, usernames and more can pass safely. When a visitor enters SSL protected area of your site then your SSL certificate automatically creates an encrypted link with the visitor’s browser. It is the process of scrambling up data into an unreadable format that can only be returned to a proper readable format with the help of proper decryption key. What is does it contain? SSL Certificate contains the certificate holder’s name, certificate’s serial number and expiration date, a copy of the holder’s public key and digital signature of the certificate-issuing authority. Our SSL Certificates show visitors that you keep their privacy your top priority. This certificate protects your customers’ sensitive information.When visitors open your SSL protected web page then their browser bar displays a padlock icon and the https:// prefix in the URL address. Standard SLL Certificates usually take 5 minutes or even less. If you want a Deluxe SSL certificate then it may take around 3 to 5 days. Security experts are present 24x7 to help our customers with technical issues. Our SSL certificates cover unlimited secure servers. They can support up to 256-bit encryption and recognized by all major mobile and desktop browsers on the market. Why SSL is necessary for a website? SSL is an extra protection to your website data and functionality that protects your website from being hacked or any protection from any unauthorized access or injection to your site or server to harm.